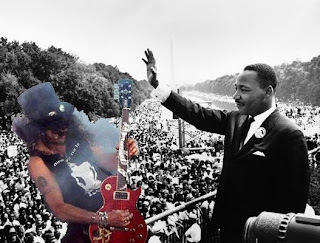 The uncanny ubiquity of former Guns 'n Roses guitarist Slash feels like a recent development, but his cheeky top-hatted antics have been around since long before T-Pain was a glimmer in pop culture's all-seeing eye. An episode from last spring's season of South Park lampooning his omniscience was arguably more overdue (and inarguably more entertaining) than Chinese Democracy. Not that most musicians wouldn't love to have Slash's staying power - he's got a healthy Q rating even among kids whose only interaction with "Sweet Child 'O Mine" is the 'oldies' rock station. But to remind you of those halycon days when a Slash appearance still seemed novel, I present this snippet from Michael Jackson's monstrous 15-minute medley of hits at the 1995 MTV Video Music Awards. Michael is about a third of the way through his entire catalogue when Slash appears to play the riff from "Black or White" complete with plumes of smoke, wind machines, etc. It's classic mid-90s "thumbing my nose at molestation allegations" Michael. Then it's time for the guitar solo. 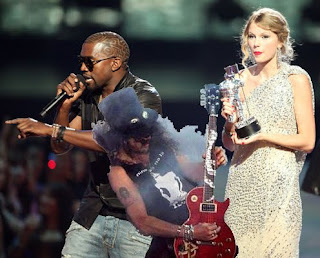 And Slash knows how to solo. He just doesn't know how to stop. Fans have pointed to some similar performances as evidence that Michael's anger is staged and that the uncontrollable soloing is part of the act.1 I can believe that explanation, considering the scope of Michael's stage production and his legendary perfectionism. But, in my mind, that only makes it funnier because ordering Slash to solo is like instructing grass to grow. 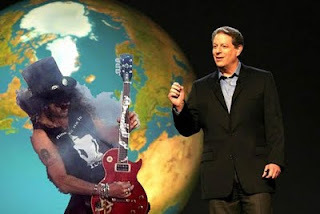 It makes me wonder - besides holding up "Billie Jean," what else could Slash delay with his insurmountable urge to shred? 1 I could be wrong. It did strike me as odd in This Is It when Michael recruits apparently-a-thing Orianthi instead of Slash to play lead guitar in his scheduled run of concerts at the Millenium Dome. 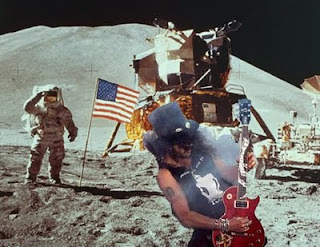 You're telling me that Slash was too busy for that payday? Then again, Michael was always shrewd in noticing when his collaborators had passed their sell-by date. There's a reason Eddie Van Halen didn't get another call after "Beat It." 2 Bringing it full circle!